Heart palpitations, panic attacks, fear of the future, psychosomatic illness, body dissatisfaction, anxiety and clinical depression are plaguing women in their 30s, 40s and 50s, contributing significantly to the astounding rise of the wellness and functional medicine industries as millions seek out alternative routes to improve their well-being. I should know— as a health and life coach in Singapore, the majority of my clients are women in this age bracket who wrestle with personal dissatisfaction, low energy, baffling physical symptoms, and self-sabotaging habits. From changing physiologies, increasing stress loads, existential crises, and maladaptive cultural coping strategies, midlife packs a wallop and women, more than ever, are feeling it. In fact, studies consistently show that the midlife crisis is a real phenomenon, with women experiencing their lowest point of happiness somewhere between the ages of 40 and 53 (peak happiness is reached at age 34, according to international research). Combined with inevitable hormonal changes during this period that radically change the circuitry in both brain and body, women are struggling. Today in the US and the UK, an estimated one in four women are taking at least one mental health medication, making up the majority of those prescribed an antidepressant, and that number appears to be climbing in Singapore as well. In many parts of the world, middle-aged women are one of the primary groups seeking treatment for substance abuse, particularly problem drinking. And, measures of subjective well-being indicate that women’s happiness has declined in relation to men’s across industrialized countries and demographic groups. So, what the heck is going on? Here are five reasons I’ve observed that underpin stress and depression for women in midlife, as well as some initial tips on how to turn things around. Although menstruation doesn’t completely stop until around age 51, women generally enter the perimenopausal phase sometime between their late thirties and mid-forties, propelling a cascade of changes to hormone levels as the body gradually produces less progesterone and estrogen while ovarian function declines. During the transition into menopause, cortisol levels rise and adrenal function may be compromised, contributing to stubborn weight gain around the abdomen typically experienced by women in their forties. The roller coaster of perimenopause generally lasts for three to four years although it can stretch on for a decade or more, bringing with it extreme fatigue, hot flashes, vaginal dryness, heavy periods, sexual dysfunction and erratic moods. This drastic shift, coupled with popular culture’s shame-based attitudes etched upon aging women as well as changes in appearance and sexual functioning contribute heavily to increased stress, generalized anxiety disorder and depression. Fascinatingly, North American and European women tend to have far more extreme symptoms than women in societies which revere older women as wise matriarchs and honor the seasons of life as well as those which subsist primarily on plant based diets, including Southeast Asia, Japan and Mexico’s Yucatan peninsula. Change up your exercise routine. Perimenopausal women often hire health and fitness professionals to help them tackle unwanted weight gain after finding that, despite exercising themselves into the ground, the weight still isn’t budging. A cyclical problem arises, particularly when personal trainers and health coaches aren’t knowledgeable about the impact these hormonal changes have on the body. 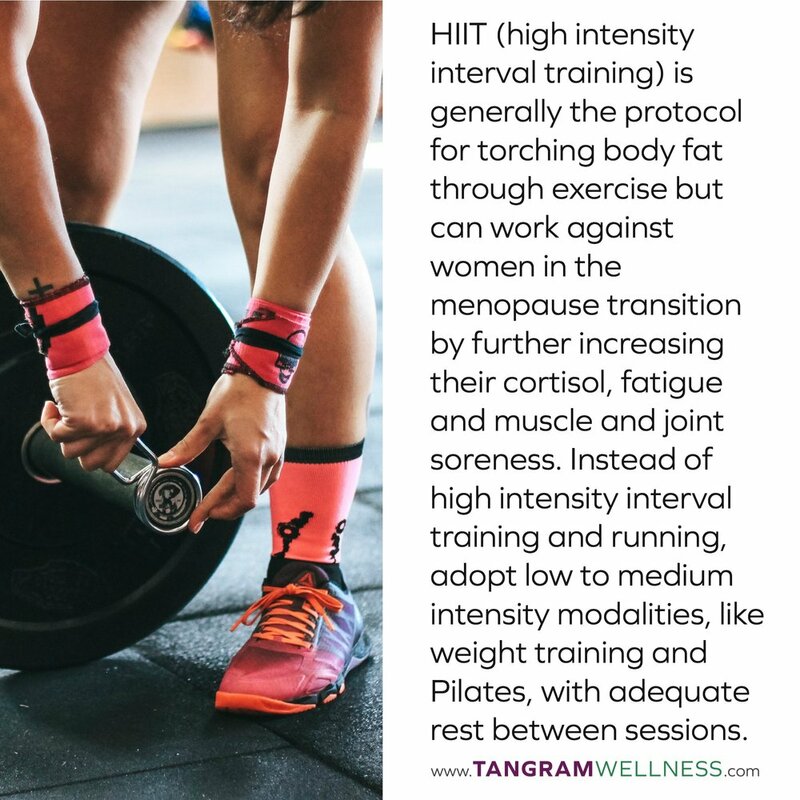 HIIT (high intensity interval training) is generally the protocol for torching body fat through exercise, but can work against women in the menopause transition by further increasing their cortisol levels, fatigue and muscle and joint soreness. Instead of high intensity interval training and running, adopt low to medium intensity modalities with adequate rest periods. Breath-focused Pilates and strength training, which can help stave off osteopenia, are good options during this time. Additionally, “while guidelines have advocated an accumulation of at least thirty minutes a day of moderate-intensity exercise most days of the week (150 minutes per week), a major study (the DREW study) found that a lower amount of activity was associated with a significant improvement in fitness for women in their mid- to late-fifties,” just after menopause. Lower amounts of exercise can also benefit clients in the perimenopause phase, particularly if they’re not getting enough restful sleep. Make sleep a priority, and aim to get at least 8 to 9 hours of shuteye a night. Sleep length and quality plummets during this time as melatonin levels decrease, cortisol rises, and everyday life takes on a frantic quality. When women don’t sleep, restorative DHEA and growth hormone cease production, which in turn compromises the immune system and contributes to inflammation in the body. This reaction has a tendency to set off clinical depression. In this age, sleepless warriors are touted as demi-gods, celebrated for their ability to subsist on 4 or 5 hours a night. In Singapore, most people are clocking just over 6 hours per night— not nearly enough for restoration and rejuvenation. Ignore the hype and commit to some serious rest. Turning your bedroom into a peaceful, device-free and cocoon-like sanctuary, practicing a bedtime ritual such as prayer or mindfulness, and taking melatonin and ZMA (zinc+magnesium+B6) supplements half an hour before lights off can all help contribute to better quality sleep. If you’re bolting up in the middle of the night— common for perimenopausal women— don’t just lie there! Get out of bed, make a cup of relaxing tea such as kava tea and read a boring book. Whatever you do, avoid looking at your phone or laptop screens- exposure to blue light is a primary culprit of insomnia. Around one’s mid-thirties, some people begin to wake up to the fact that they’ve designed a life and chosen a career path that they thought would please others— usually their parents, a peer group, or some nebulous societal definition of success. However, many of us find that as we stabilize financially in our thirties and forties through careers that are personally unfulfilling, regret and energy depletion eventually catch up, particularly for women who have tucked their artistic or altruistic ambitions into the cobwebbed corners of their hearts. Become an apprentice. Rather than diving in to what you think might satisfy your purpose, seek out opportunities to volunteer or intern in roles that appeal to you, or audit diverse courses to get a taste of your options. Apprenticeships are not just for twenty-somethings. Increasingly, midlife adults are seeking internship opportunities as a way to hone new skills and explore what might be most pleasing to the child within. Honor your subconscious and body wisdom by ceasing to overthink. In his book, “How To Be An Adult,” psychotherapist David Richo writes that “in matters of the heart, thinking (ironically) leads only to more confusion. 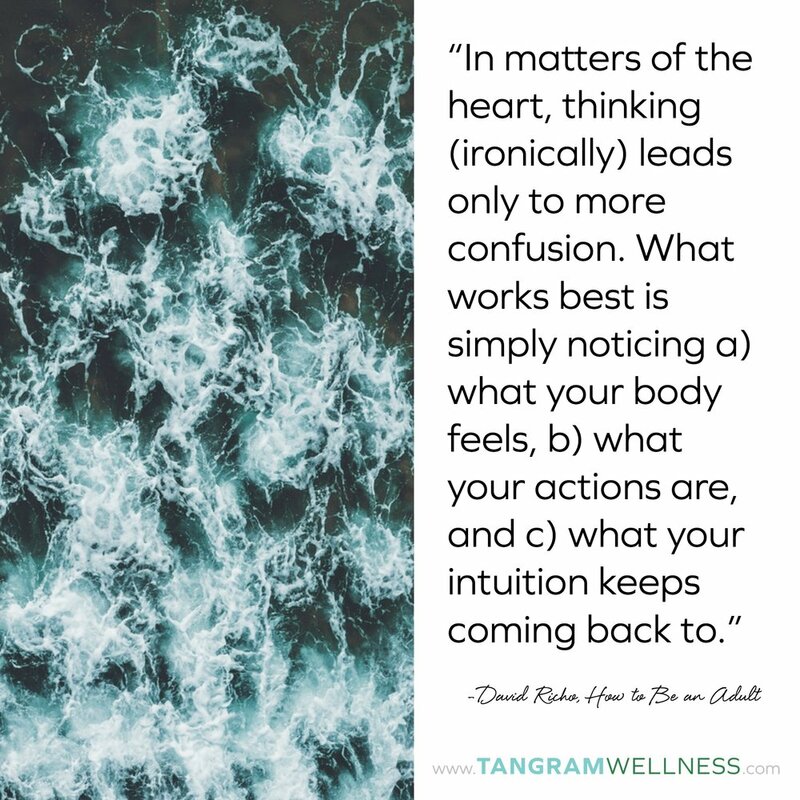 What works best is simply noticing a) what your body feels, b) what your actions are, and c) what your intuition keeps coming back to.” We have a tendency to overanalyze our options. Free journaling, body scan meditations, and centering prayer are all tools you can use to get out of your head and into your heart. While the “midlife crisis” has typically been seen as the domain of forty-something men who trade their responsibilities in for a flashy car or a fling, women also contend with a shifting sense of self. Enlisting a qualified psychologist or psychotherapist to help you uncover, work through and process any trauma or present life circumstances contributing to substance use is paramount in obtaining an awakened, clear-eyed life. Some coaches, including myself, are trained and experienced in supporting individuals battling a reliance on alcohol or prescription drugs, and in helping to change self-sabotaging habits and behaviors. Ceasing to self-medicate generally requires some professional support, at least in the beginning. Don’t be afraid to ask for help! Fellowship-based support groups like Moderation Management, SMART Recovery and AA are available around the world, and many have women-only options. Find what works for you… and you may also find many other women that you can relate to. As more women identify as “spiritual but not religious,” discontent with life has also seemed to escalate, evidenced by increases in antidepressant and anti-anxiety prescriptions, heavy drinking, eating disorders in midlife... and a wellness industry that’s now estimated to bring in $4 trillion dollars globally at last count, with no signs of stopping. 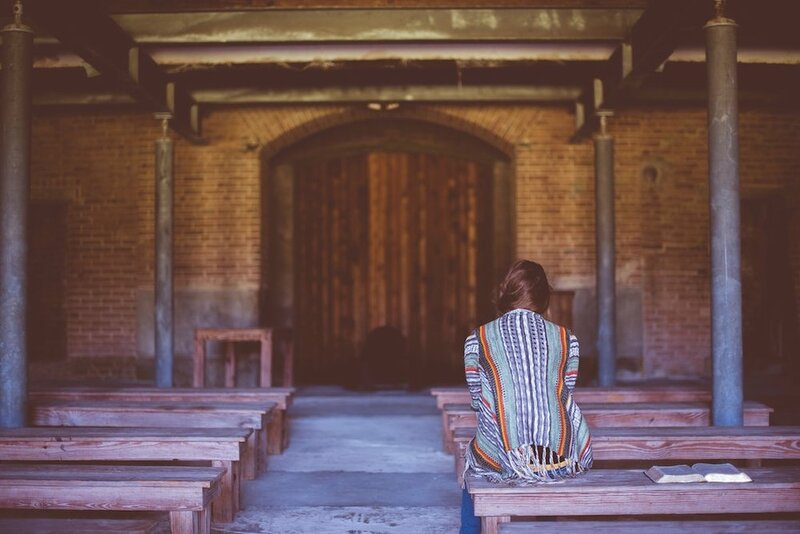 In fact, according to a study published in the British Journal of Psychiatry, people who are spiritual but not religious are more likely to suffer from poor mental health, including a dependence on drugs, eating disorders, anxiety, phobias and other neuroses— findings that support other similar studies. Surprisingly, atheists tend to fare better than the “spiritual but not religious” group, while those who identify as “religious” have the highest rates of life satisfaction as well as lower rates of depression and suicide. Seek out true spiritual leaders who have devoted their lives to their faith or belief system and have a conversation with them about your questions and struggles. Come armed with questions and a healthy curiosity about how they’ve come to know what they do, as well as their routines and overall outlook. This can seem extremely intimidating, but many will be willing to talk with you. Spend time regularly in nature, open to the silence and the wonder surrounding you. Book a walk with your friends through jungle or forest, basking in each other’s company while staying present to the sounds and sights of the natural environment. It’s no coincidence that many mystics, monks and saints found their connection to the divine while on a mountaintop or deep in the woods. In Singapore, wealth and status are doggedly pursued, fueling the rise of moneylenders, pawnshops, plastic surgery and marital strife. Social media compounds this insatiable need for prestige, providing a virtual platform to “keep up with the Joneses”. Between the duties of family and career, as well as social responsibilities and the pervasive need to live a double life— the one based in reality and the one shared on social media— women play professional juggler while striving to look the part of perfection, people-pleasing in the process. No wonder they’re drained! On the other side of the issue are our expectations of what it means to have a comfortable life, and how much is actually enough. Two common sights in Singapore are the luxury sports cars parked outside HDBs (public housing) and the administrative assistant carrying a new Louis Vuitton handbag. Privileged expats are also stretching themselves to the limit in an effort to keep up with appearances. In response to runaway consumerism and the stress of modern life, movements in minimalism and essentialism are spreading beyond a niche group of millennials and into the mainstream. Fold a paper lengthwise down the middle, creating two separate columns. In one column, write down every single thing that takes up your time and energy in a one week period. Be specific! Now, in the second column, write down no more than half of the things that you really and truly need to do each week. Finally, highlight or underline the top three things that matter. Can you envision what your life would be like if you lived by the second column, paying particular focus to the three things you underlined? Suffering is an inevitable part of life woven into the human experience. But, accepting suffering as one of the many waves we’ll each face does not have to equate to a life of stress and depression. Cultivating purpose, self-respect, and a strong spiritual foundation along with a focus on the essential and an acceptance of the seasons that each of our bodies will endure invites peace and vitality back into our lives, no matter what our age or circumstances. I wish you good health, and thanks for reading! Wow- you got to the end- it was a long one! Did this post help you in some way? If so, share the love on social media or in an email to someone who could use the read. (2017) “Perimenopause: Rocky Road to Menopause.” Harvard Women’s Health Watch, Harvard Medical School. Nouwen, Henri. (2013) Discernment. Harper Collins. (2013) King, Michael, Louise Marston, et al. “Religion, Spirituality and Mental Health: Results from a National Study of English Households” The British Journal of Psychiatry. Picture this: You begin feeling tired for no apparent reason and your weight mysteriously increases, especially around the midsection. So, you do what many people would do in this situation- you put your energy into a plan that will help you shed the weight and increase your energy. And yet, after a few months on this plan, you still find yourself exhausted and the weight- well, it ain’t budging! So, you change up your fitness plan, only to discover that no matter what you do, you’re still stuck on square one. Of course, you’re frustrated- the weight keeps climbing while your mood and overall outlook starts to plummet. As a personal trainer & hormonal fat loss nutrition coach, I see this scenario on a regular basis in the many women who come to me struggling with various hormone-related weight issues, including PCOS, pre-insulin diabetes, cortisol irregularities and adrenal fatigue or dysfunction. Many fitness professionals focus on the external, paying minimal attention to the person’s overall well-being. And, the majority of medical professionals tend to focus on treating a person’s symptoms by prescribing medication without actually digging for the root cause of the issue. As adrenal issues become increasingly common in our modern, stressed-out society, changing this dynamic is going to be crucial. What exactly is Adrenal Fatigue and why haven’t many heard of it? Before we can understand what adrenal fatigue is, we first have to understand what the adrenal glands are. Our adrenal glands are known as our “fight or flight” control station, and are stimulated whenever we feel excited, threatened or anxious through the release of cortisol and adrenaline/noradrenaline. Our adrenal glands are also vital in maintaining healthy blood pressure through salt regulation via the hormone aldosterone, and help the body deal with change and other stressful life situations. Abnormal physical issues start to arise when the adrenals are constantly stimulated over a long period of time- often through chronic emotional or physical stress. This is a state of suboptimal health caused by adrenal glands that are no longer working well. Cortisol levels are also impacted, with too high cortisol levels at night and low cortisol in the morning, leading to a “wired yet tired” feeling. Conventional medicine does not currently accept “adrenal fatigue” as a medical diagnosis, despite lots of evidence to the contrary, and many endocrinologists only test for “adrenal insufficiency,” which is when adrenal functioning has already entered an “emergency” zone. However, looking at adrenal functioning as a black and white issue, rather than on a continuum, does not make much sense when we take into account the way our bodies function naturally. As a parallel, consider the diagnosis of “high blood pressure.” Given that 120/80mmHg is considered a normal and healthy blood pressure, does 121/80 automatically put one into the category of high blood pressure? It is like this with the adrenals- our adrenals work along a spectrum of functioning. So, what are some of the symptoms of adrenal fatigue? Generally speaking, the less the state of adrenal dysfunction, the fewer the symptoms are and subsequently, the road to recovery can be much faster with a couple of weeks of good restful sleep, eating unprocessed and nutritious food, and getting enough movement and sunlight. Adrenal fatigue symptoms may seem confusing and contradictory but that is because they reflect the body’s way of working to returning any imbalances back to the norm -- also known as homeostasis. Since the endocrine system is highly complex and adrenal functions are inter-related to other glands and hormones such as the pituitary, pineal, thyroid, pancreas, ovaries, and testosterone, it makes sense that when the adrenal glands are constantly stimulated, this will cause a cascading effect on the other functions of the body. It is not surprising then that a lot of women with hormonal issues such as PCOS, diabetes, hypothyroidism and auto-immune disease also show signs of adrenal fatigue syndrome. The conventional medicinal approach is to prescribe medicines to mask the symptoms, but this often a temporary solution, causing more damage in the long run. In some cases where the adrenals have not been functioning normally for a long time and are no longer able to produce sufficient cortisol, the person’s mental health will also take a hit in the form of depression and/or anxiety. If you feel like you might be dealing with adrenal fatigue, don’t be surprised to find that the majority of healthcare professionals will not accept this as a possibility. As I mentioned, there is currently a black and white approach to diagnosing adrenal issues, as well as limitations in adrenal function testing. The standard method is to perform a blood test, which is not helpful when it comes to diagnosing Adrenal Fatigue. One of the easiest ways to get around this is to get a 24-hour salivary cortisol test (not a singular cortisol test as it does not tell the whole story). Some experienced medical doctors, as well as those trained in functional medicine, may order a series of 24 hour cortisol tests over several days to get a more accurate picture, alongside testing for DHEA levels. What Options Do I Have For Recovery? · and, getting well-educated with the right practitioner on how to manage your condition. Because we are each highly unique individuals, the key solution towards adrenal recovery will be an integrative approach towards a comprehensive lifestyle plan that work optimally for you. · other lifestyle shifts involving sleep, mindfulness practices and stress-reducing activities. I urge you to start waking up to the signs your body is telling you and start caring for your adrenal glands through proper nutrition, rest, mind-body practices and other stress relief activities. Even though adrenal fatigue is not commonly accepted in conventional medicine yet, this will likely to change over the years as the medical community evolves with research and clinical trials. However, there is no need to wait to until the day when “adrenal fatigue” is accepted into the mainstream. Start tuning into the messages of your body and make a commitment to self-care as you travel on the road toward optimal health. Yan Huang is a certified personal trainer and hormonal fat loss specialist who focuses on complementary healing for hormonal imbalance through fitness, nutrition and self-care. If you have questions for Yan or would like to book a complimentary consultation, email her at Yan@tangramwellness.com . If you liked this post, share it! Have a comment? Leave it below- we always love to hear from you.